Updated Wednesday March 20, 2019 by Randy Cantrell. 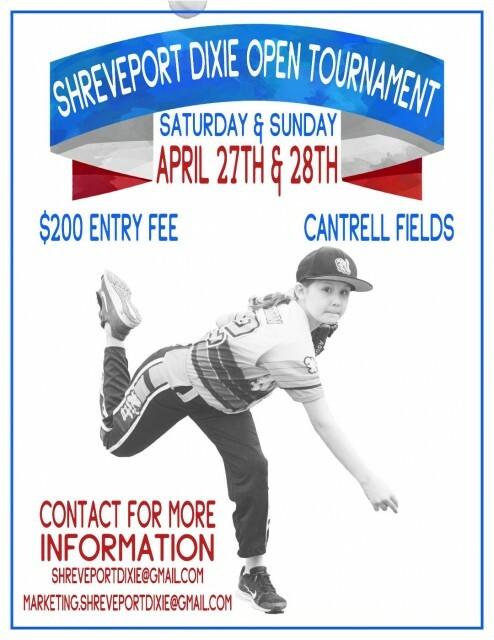 Dixie Open Tournament - Shreveport Dixie Open will be held at Cantrell Fields home of Shreveport Dixie Baseball, 9551 Interport Drive, Shreveport, La 71118 on Saturday April 27 and Sunday April 28.. Entry Fee is only $200 per Team. We will offer 5/6 T-Ball, 7/8 Coach Pitch, 9/10 AAA Player Pitch, 11/12 O-Zone, and 13-14 (54-80) Dixie Boys.Enter now before the brackets fills up. Enter now!!! !